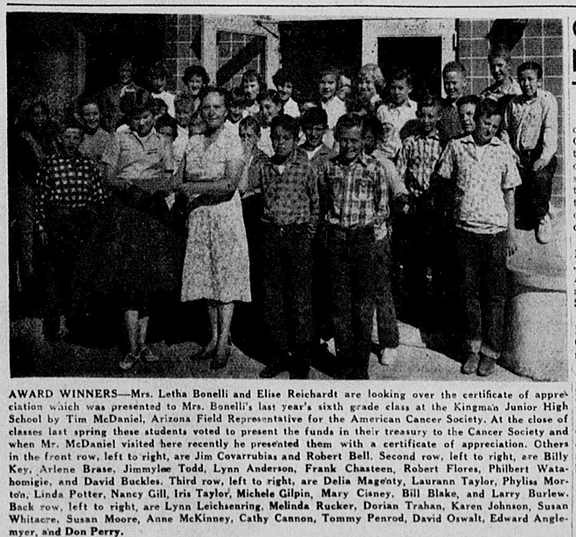 In the fall of 1959 a photographer for the Mohave County Miner came to Kingman junior high school to take a photo of Mrs. Bonelli's 6th grade class. As the caption, below, explains, we had voted to donate our class funds to the American Cancer Society. I was the biggest donor at $5 and that's why I'm standing out front at right. What is not in the caption is that I was fined 10 cents for every time I talked out of turn in class and I ran up the $5 in fines. Jimmy Covarrubias came in a distant second, and the reason he looks so sheepish is he only "donated" $2.50. Cathy Cannon, in the back row, was one of Mrs. Bonelli's pet monitors (I think she had three and, if memory serves me correctly, Lynn Leichsenring and Elise Reichardt were the others) and Cathy would catch me talking to my neighbor and she would conspicuously and dramatically put a check mark next to my name on a list of students which she kept on her desk. When I would protest, she would make another mark. So I would stick out my tongue at her, and she would put another mark next to my name. This went on for the entire semester, and, well, the results speak for themselves. The lesson here, is, sometimes it pays to talk out of turn. I thought of this often when I was on KSLX, 100.7 FM radio in Scottsdale, where I basically did exactly what I did in Mrs. Bonelli's class: for three hours a day, five days a week, I talked out of turn on the Jones & Boze Show. The only difference is, on the radio I got paid $112,000 dollars a year to do what I was trained to do in Mrs. Bonelli's class. So thank you Mrs. Bonelli and Cathy Cannonball! "And that's the news, smack-dab-in-the-middle of the West's Most Mid-Western Town!" Ha, amateur. I talked out of turn so much Mrs. Grubba put my desk up in the corner for two weeks, forcing me to turn around to talk out of turn. She couldn't charge us any money because not one of us had a red cent in our purses or pockets. Our frugal Wisconsin farm dads would never part with a penny to keep us quiet so it was up to our harrowed teachers to enforce the no-talking rule. Mrs. G. went to my church too, but I was a different child there, quiet and shy, quite intimidated by the reverent atmosphere and staring statues. I'm pretty sure that she believed me to be so angelic at church purely to tick her off, when every day at school, she was facing my endless chatter. The poor dear.